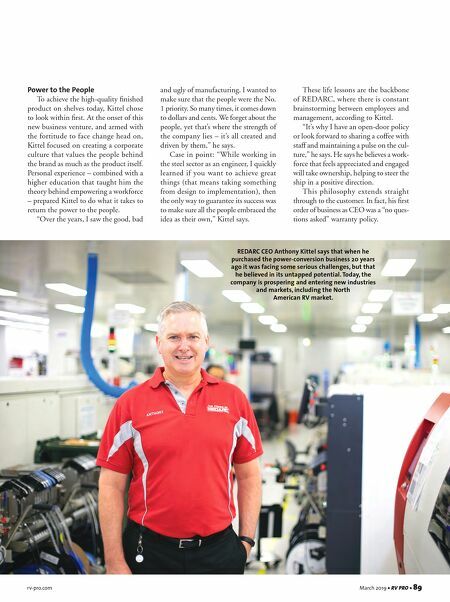 88 • RV PRO • March 2019 rv-pro.com A F T E R M A R K E T T he late Bob Mackie was an elec- tronics engineer whose pas- sion for innovation led to the founding of REDARC, an Australian company manufacturing vehicle igni- tion systems and voltage converters, many of those products designed with the country's tradition of overlanding, self-reliant adventure travel to remote destinations in mind, where the journey is the primary goal. The business began humbly in 1979, with eight employees working out of a tin shed in Lonsdale, South Australia. With a talent for invention, Mackie established the core products for a brand with enor- mous potential. However, it would take a new gen- eration of leadership to transform that groundwork into a powerhouse with global reach – most recently in the North American RV market, where the company has exclusively partnered with Keystone/ NTP-STAG. Rejuvenated Brand As sometimes happens with small businesses, cracks began to surface after Mackie's unexpected death in 1995. "The company was struggling by the time we stepped in, and the products were getting a bit tired," says Anthony Kittel, owner and CEO of REDARC since 1997. Among the challenges were antiquated manufacturing processes, mounting warranty issues and poor customer service policies. Despite that, Kittel chose to invest in a company that seemingly lost its way because he believed the untapped potential of the small power-conversion manufacturer outweighed the risk. Today, REDARC remains fami- ly-owned and operated, but its portfolio has grown to span various industries and market segments, from military, mining and emergency services to OEM, auto- motive aftermarket and RV. The exponential growth of REDARC can be attributed to many factors, including substantial investments in R&D, the development of versatile products guaranteed to perform in any condition and a genuine focus on cus- tomer service, according to Kittel. "I am passionate about innovation and product development. Nothing gives me more satisfaction than developing a product that customers love and ask for by name," he says, "but I am also pas- sionate about establishing a culture in the business that allows people to enjoy coming to work every day." 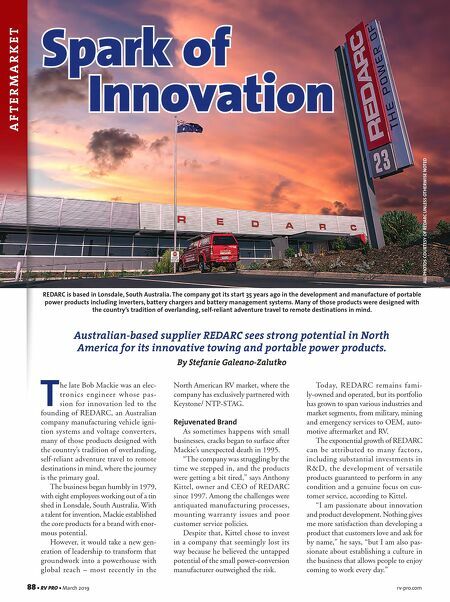 Spark of Innovation Australian-based supplier REDARC sees strong potential in North America for its innovative towing and portable power products. By Stefanie Galeano-Zalutko ALL PHOTOS COURTESY OF REDARC UNLESS OTHERWISE NOTED REDARC is based in Lonsdale, South Australia. The company got its start 35 years ago in the development and manufacture of portable power products including inverters, battery chargers and battery management systems. Many of those products were designed with the country's tradition of overlanding, self-reliant adventure travel to remote destinations in mind.